MINNEAPOLIS--(BUSINESS WIRE)--Aug. 9, 2018-- Sleep Number is revolutionizing sleep with their category-creating Sleep Number 360® smart bed, starting at $999. The company is bringing proven quality sleep to Manhattan, where customers can experience the life-changing benefits of smart, connected sleep. This new store in the Flatiron District adds to their portfolio of more than 560 stores in all 50 U.S. states. The store experience includes a large digital map illuminating how neighborhoods across New York are sleeping. It is a fun competition to see who is sleeping the best. It’s also a great illustration of Sleep Number’s powerful sleep tracking and biometric technology – SleepIQ® technology. The brand’s full Sleep Number 360 smart bed presentation is available with an interactive experience that illustrates the benefits of smart sleep. Customers will participate in an individualized experience using 3-D imaging to identify pressure points and understand how the 360 smart bed will alleviate them. They will see and feel how adjusting the firmness for each person, their Sleep Number setting, will result in ideal comfort. Unique to Manhattan, customers can take a 3-minute immersive “ride” into the science behind our 360 smart bed and understand how our technology delivers proven quality sleep. A mix-and-match bedding design lab, equipped with a large-scale digital planner, completes the experience, as customers customize their ultimate bedroom retreat. These interactive elements complement the store’s sleep experts, who are dedicated to the company’s mission. Sleep Number has been developing the New York market over the past few years, as part of its ongoing market growth plans that include an integrated brick-and-mortar and digital retail experience. Just last week, the company repositioned its Lake Grove store on Long Island and opened a new store at Staten Island Mall. 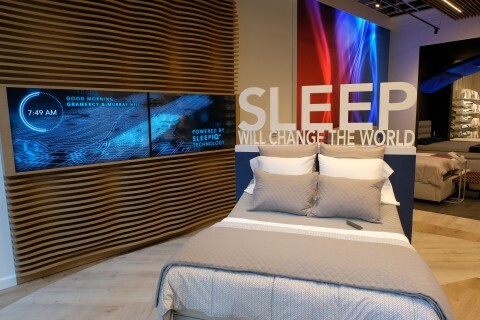 Sleep Number expects to have 25 stores in the market by the end of the year, and approximately 585 stores nationwide. As the leader in sleep innovation, Sleep Number Corporation delivers the best quality sleep through effortless, adjustable comfort and biometric sleep tracking. Sleep Number’s proprietary SleepIQ® technology platform – one of the most comprehensive databases of biometric consumer sleep data – is proving the connection between sleep and wellbeing. With breakthrough innovations such as the revolutionary Sleep Number 360® smart bed, Sleep Number is redefining the future of sleep and shaping the future of health and wellness. To experience better quality sleep, visit one of the over 560 Sleep Number® stores located in all 50 states or Sleepnumber.com. For additional information, visit our newsroom and investor relations site.